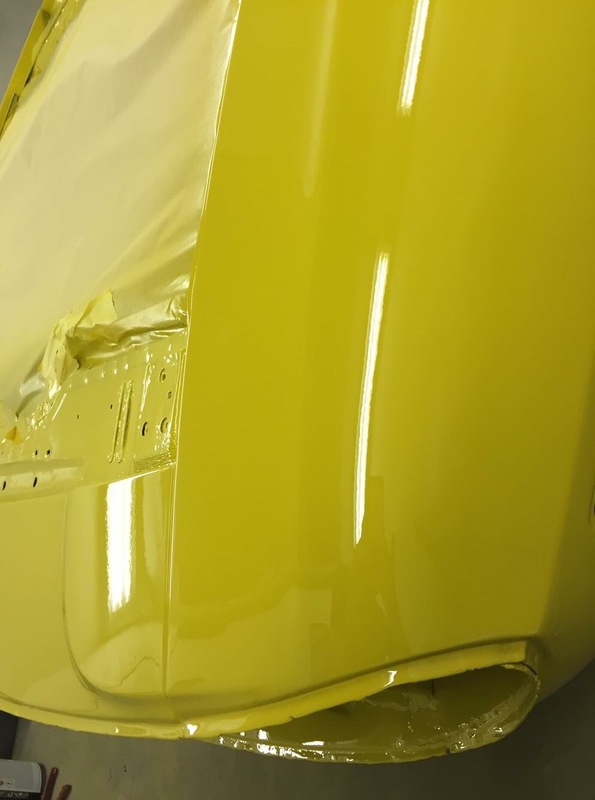 Body Work Adventures – Part 3, Paint! The Next episode from Julie and Tony…. We left the Stag last time having made it to the spray booth, and just because it it now one of our favourite photo’s here it is again. Now we wait for the updates each day from Iain to show how the next stage is progressing. First we have the masking stage, keeping the paint to the places we want it and not where we don’t. Now Tony said to send pictures through so he could tease Julie, as I had been (Julie’s writing this 🙂 ) a little excited each day as the photos had arrived. The next day arrived and after the windscreen had been fitted – a wonderful and very satisfying job by all accounts – NOT we were to arrive to see the car and take her home. Thanks to the windscreen fitter – Russell at Ultimate Windscreens, who did a fantastic job of refitting the glass and chrome trim. We arrived to find the car waiting for us outside the workshop. The bonnet and boot were to follow on in a couple of days but it didn’t take away from just how stunning she looks!! We chatted with Iain about the final look, and it is just as we wanted. The car retains its character, this is our car, it will take us to work, go shopping as well as days out and classic rallys. A few days later Iain arrived with the bonnet and boot, and very carefully – with only a few heart stopping moments they are fitted back to the car. 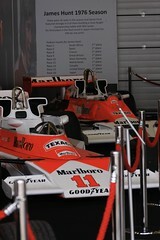 We still have to put the bumpers, lights, carpets, badges, grill etc back on the car – there is a nice long list. All ready for the NEC Restoration show. See you there March 5th and 6th – come and see the car on the Stag Owners Club stand Hall 6 Stand 340. 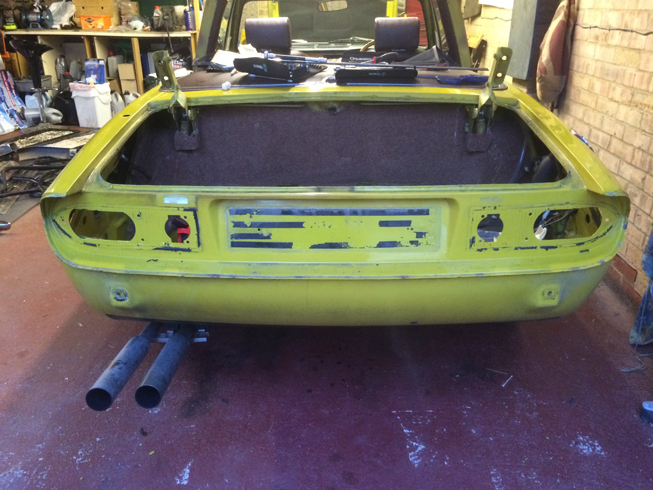 Tony and Julie tell there story of their Stag strip down and re-paint…. 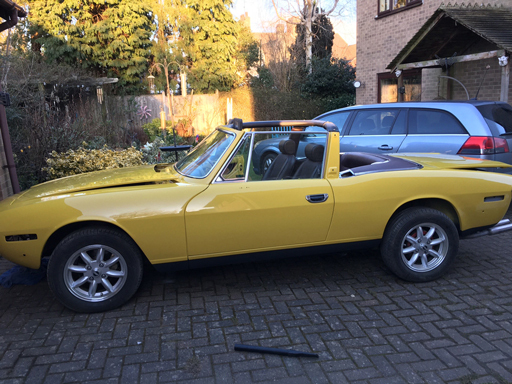 We have owned our Stag for 5 years, it was bought as a car to be used and improved as we went along. With loads of help and support from Stag Owners Club members we have replaced the suspension all round, replaced the diff nose and refurbished the cylinder heads. With the knowledge from working with club members we have tackled on our own replacing the exhaust, changing the carburetors, rear brakes, water pump, replaced the front lights and re-veneered the dashboard. This winter we decided that we needed to find out just how good or bad the bodywork is as we had some cracking on the rear wing and rust coming through on the boot. 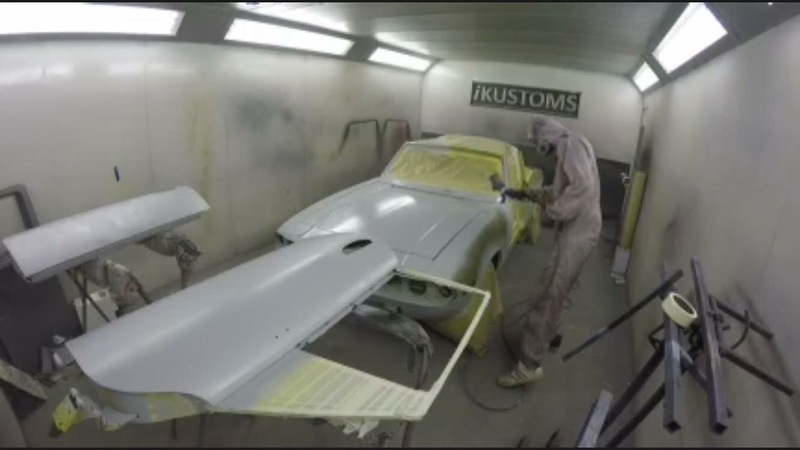 We found a recommended body shop just 5 mins from where we live, so towards the end of the summer we paid Iain at iKustoms a visit to look over the car and discuss the work. 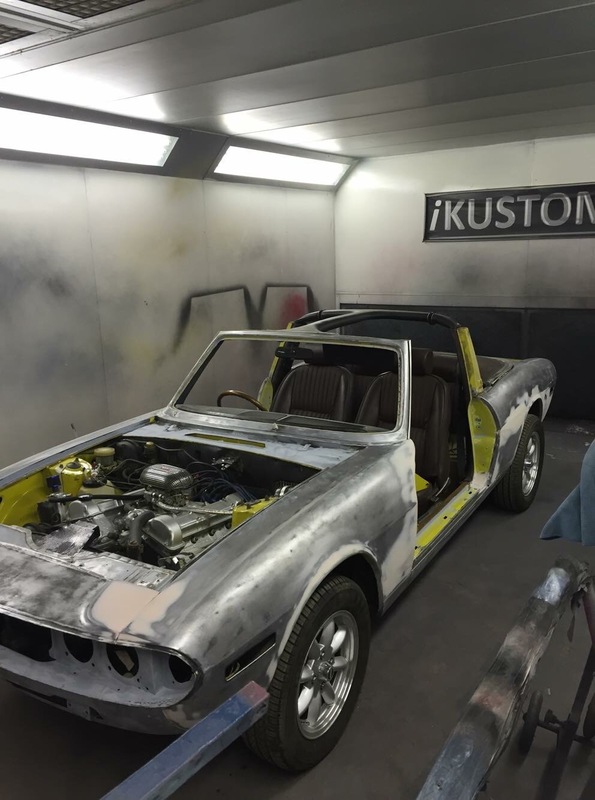 We wanted to play an active part in the restoration so as we have no welding, or any other bodywork skills we did the best job……. stripping off all the paint, and yes we were to go all the way to base metal!! We started in October, I am not sure we knew just what it was we were taking on. It was a mammoth job, and quite scary as you really have no idea just what you are going to find when the paint and filler is eventually removed. 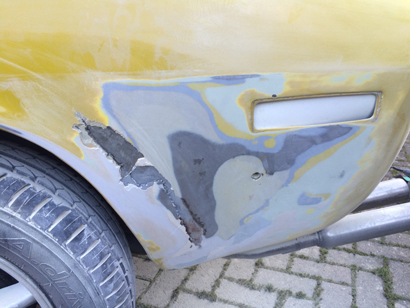 We started outside on the nearside back wing where there was a crack in the paintwork around 5″ in diameter, apart from the rust showing through on the boot lid that was the place we thought was going to be the worst. Once we got through the top coat of paint you could see a large amount of filler, at first we carried on with the sanding, but when the filler started to “move” we changed tactics to a screwdriver and hammer to gently chisel the filler off. A rather bad repair job was revealed under in some places 5mm of filler!! We knew that our car had perhaps not been looked after that well previous to us buying it and so we were very surprised at how few holes we actually found. The nearside turned out to be the worst with a few bad repairs to the rear wing and 3 fairly small holes along the bottom edge where the panels meet the sills. Under Iain’s instructions we etch primed each panel as it was rubbed down (after any rust treatment had been applied) to keep rust bug at bay until he took over. We had put the hard top on the car while we were sanding to try and keep some of the dust out of the car. 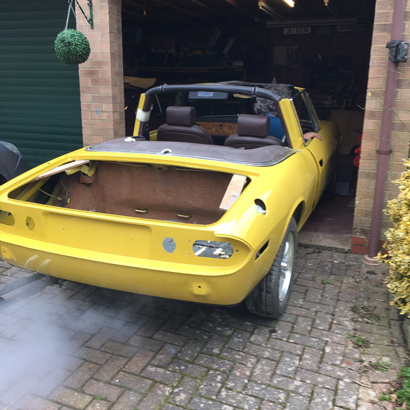 This did help, the hardtop was not being sprayed as it has sat in our garage for 3 years and not been used so this was its last task and would be sold on once the car goes to iKustoms for the work to begin. Our bonnet and boot were not the best, the bonnet was quite easy to source as there are plenty out there. 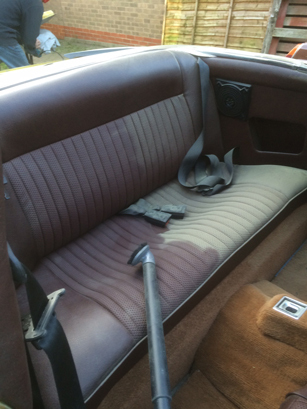 The boot however is another matter, we were very lucky to hear about a very good and solid boot lid that was for sale and so snapped that up. Once we finished sanding the main car and on a dry day just before Christmas we pushed her out of the garage so we could try on the new boot and bonnet but also start the other mammoth job of removing the dust from the garage!! Oh yeah the hard top did a good job of keeping some of the dust out of the car but not all!!! 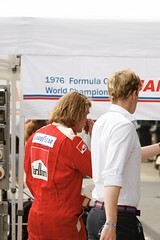 On 20th January the car was transported up to Iain’s workshop for the transformation to begin. Now we wait for Iain to work his magic on the bodywork and the sad looking grey car that left will come back in all her glory ready for her debut at the NEC Restoration Show in March. Next time – what happened at the body shop and chromers……. NEC Classic Car Show – here we come!!! Da Da Daaaa – RALLY STAG! News, views and chat from the National Trust at Charlecote Park in Warwickshire. Your one stop to all things automotive!